We were sent a bottle of new Persil 2 in 1 with Comfort Liquid Detergent to test and review. It has come in very useful with all the extra washes we're doing as we're now a family of 4 - there doesn't seem to be a day go by without the whirr of the washing machine (very useful for getting Noah to sleep!). Persil 2 in 1 comes in two variants, Passion Flower - the one we tried, and Sunshiny Days. 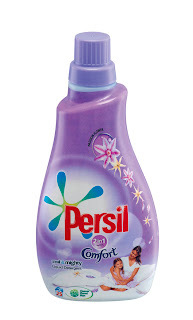 We don't usually use Persil, we tend to be a shops own brand user or more recently Fairy since Isla came on the scene. We do however use Comfort Fabric conditioner as I think it has the best, most long lasting smell on our clothes and gets them lovely and soft. Before using it I did feel dubious about using a 2 in 1 product, as surely it can't produce the same results as separate products. I am a bit of a traditionalist as well and feel quite loyal to powder detergents. What did we think? Well our clothes smelt lovely, really floral and fresh. I used it on our bedding and there is nothing like getting in to a bed that has freshly laundered sheets and the pillow cases smelling clean, it's as nice as smelling freshly cut grass in summer! The whole of downstairs was filled with the heady scent of flowers. In terms of cleaning power, it was good, I'm not going to say perfect but to be honest I'm finding some of the stains that Noah is creating (I think you might know the kind I mean!) are tough for any detergent to remove completely. What I like about it is that 2 in 1's create less packaging waste and you save money as you're only buying 1 product. I would recommend Persil 2 in 1 and think it will become part of our laundry repertoire.